Four weeks ago I decided to have a Christmas Party. Two weeks ago I had the party and it was a hit. 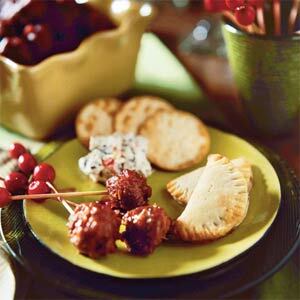 I made all the appetizers myself and made sure that they could be made a head of time. I had enough to do prior to my companies arrival. My menu was all finger foods. 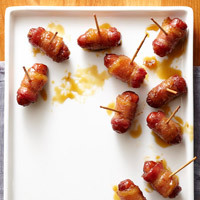 I started with Cranberry Meatballs in a wonderful Cranberry & Chili sauce than made the Deviled Eggs with Smoked Salmon & Cream Cheese, and last but not least Bacon Wrapped-Brown Sugared Smokies. Listed below are all the recipes. Enjoy! Combine first 8 ingredients in a large bowl. Shape mixture into about 54 (1-inch) balls. Cook meatballs, in batches, in a large skillet over medium-high heat until browned (about 5 minutes); remove meatballs from pan, and drain well on paper towels. Stir together cranberry and chili sauces and next 5 ingredients in a large Crock Pot. Add meatballs; reduce heat to low, and cook, stirring occasionally, 20 to 25 minutes or until centers are no longer pink. Note: To make ahead, place cooked meatballs in a zip-top plastic freezer bag, and freeze up to 1 month. Thaw in refrigerator, and cook, stirring occasionally, until thoroughly heated. Place eggs and enough water to cover in a saucepan over medium heat; bring to a boil. Cover, remove from heat, and let stand 15 minutes. Drain; return eggs to saucepan, and add enough cold water and ice to cover. Let cool. 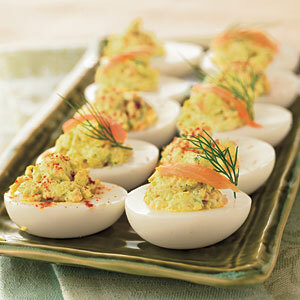 Remove shells from eggs, halve each egg lengthwise, and scrape yolks into a bowl. Reserve egg whites. Combine yolks, salmon, and next 7 ingredients, mashing with a fork until well blended. Spoon filling into reserved whites, cover loosely with plastic wrap, and refrigerate up to 2 days. Garnish, if desired. Preheat oven to 350 degrees F. Line a 15x10x1-inch baking pan with foil; lightly coat with cooking spray. Set aside. Wrap each sausage link with a bacon piece, overlapping the bacon piece at the end. Press the end of the bacon piece to seal or secure it with a wooden toothpick. Place brown sugar in a large plastic storage bag. Add several bacon-wrapped sausages to bag and seal. Shake bag gently to coat sausages with brown sugar; place sausages in prepared pan. Repeat with remaining bacon-wrapped sausages and brown sugar. Bake about 30 minutes or until the bacon is browned. Serve immediately. Makes about 45 appetizers. Fantastic Finds Friday !*!*! It's a SHORE Thing !